Today’s travels will take us to the northern section of the Jezreel Valley, with a drive over the Gilboa mountain range, into the Jordan River valley. The area, though relatively compact, is replete with historical and biblical significance, and is often referenced in the Old and New Testament. Our journey will first take us to the ornate basilica on the top of Mt. 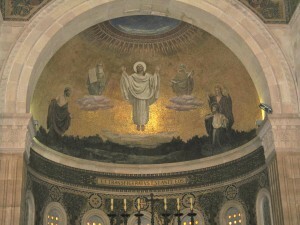 Tabor, venerated by Christians as the site of Jesus’ Transfiguration. After a stop at one of Israel’s premier art museums at Kibbutz Ein Harod, we will make our way to nearby Ma’ayan Harod National Park, at whose spring, it is said, Gideon chose his most capable warriors in the battle of the Israelites against the Midianites. A scenic excursion over the adjacent Gilboa mountains will lead us to the impressive 6th century Zodiac mosaic at the Beit Alpha Synagogue. 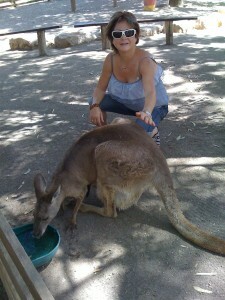 At nearby Gan Hashlosha, a swim break, or a visit to an Australian themed nature preserve to visit kangaroos and koalas, will delight the kids. Later in the afternoon, (after an optional visit to Beit Shean and an overnight stay at a kibbutz), it’s on to visit a majestic Crusader era castle and the museum site of a former kibbutz and hydroelectric power plant at the Israel-Jordan border. From Tel-Aviv or Jerusalem it’s about a 90 minute drive to Mt. Tabor. 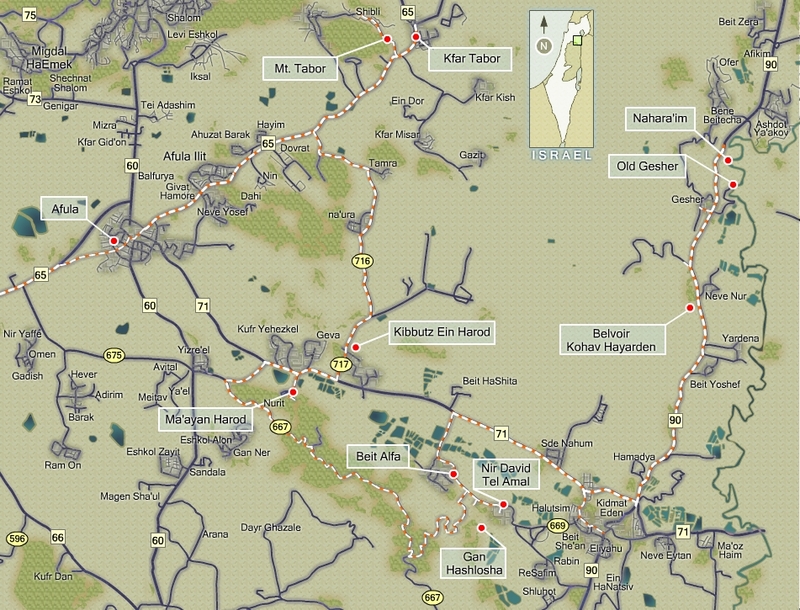 Take route 6 to the “Iron” exit and proceed north through the ” Wadi Ara” toward Afula. You’ll be traveling on Route 65 through the Arab villages of Umm el Fahm and Musmus, following the path taken by Egyptian forces led by Pharaoh Thutmose III more than 3400 years ago. As you wind your way down from the heights, you’ll note Tel Megiddo on the left, which merits a long visit if you are an archaeology buff. This is also the site, as referenced in some Christian liturgy, as the future Armageddon. You have now entered the Jezreel valley, called in Hebrew Emek Yisrael, which today is home to countless moshavim and kibbutzim, harvesting much of Israel’s grain, cotton, produce and sunflowers. In antiquity, the valley saw epic battles between the Egyptians and the King of Kadesh, Gideon and the Midianites, Saul and the Philistines, and Romans against Jewish forces. In modern times, Napoleon led his French troops through the valley, as did General Allenby in his advance against Ottoman forces in World War I. Follow Route 65, a very straight road laid by the Romans, and known in Hebrew as Hasargel, i.e. measuring stick or ruler. The road then meanders through the businees/industial section of Afula, toward a large, but gently slopping hill in the distance, known as Mt. Tabor. Continue on Route 65 past the McDonalds sign and drive beyond the turn-off to Dabburiya on route 7266. 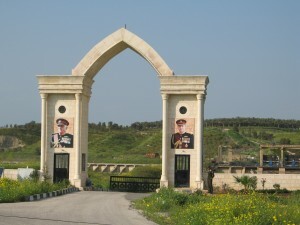 Circling around the mountain, turn left and drive several kilometers through the village of Shibly. You may wish to leave your car at the visitor center parking lot and take a taxi up the mountain, or if you are an adventurous driver, you can follow the narrow road through its 16 hairpin turns, to the summit. Visiting hours to the basilica are daily from 8 to 11:45 and 2 to 5, and from 8 to 11:30 on Shabbat and holidays. Mt. Tabor was shaped by volcanic forces which have left visible traces of basalt at its base and ascent. During the Ottoman period the entire mound, as well as much of Palestine, was deforested. However, the evergreens and other indigenous trees that you see on the hillside today were planted after the First World War, through the efforts of the KKL/JNF. Though the scenery along the drive up the mountain is dramatic, you’ll have a better opportunity to later admire Israel’s north from the roof of the basilica. Proceed through the impressive Crusader era arched entrance, to the parking lot ahead. If you are wearing shorts, now may be a good time to slip on long pants, as entrance to the compound may be precluded if you are dressed immodestly. Take a few moments to walk through the cactus and flower gardens to admire the excavations and archaeological artifacts, before heading up to the roof of the church. There, spread before you is the Gilboa mountain range, the Jezreel valley, to the east the mountains of Gilead in today’s Kingdom of Jordan, and to the north, in the distance, Mt. Hermon. In the early days of the Jewish people these lands were divided among the tribes of Naphtali, Zebulun, and Issachar, and all three tribes bordered the mound we today call Tabor (Joshua 19:22). Antiquity also saw the creation of important roads near the mound leading from Egypt to Damascus and beyond. These roads and their branches, known as the Via Maris, were further improved by the Romans and subsequent conquerors of the Holy Land. The biblical narrative goes on to tell us that in the midst of a violent storm Barak brought his men down from the summit of Mt. Tabor to route Sisera’s forces whose 900 chariots became mired in the mud of the Jezreel valley. As foretold by Deborah, Sisera himself was later killed by a woman who drove a spike into his temple as he slept in her tent. Jewish forces were not so lucky, when during Roman rule, over 10,000 men lost their lives near Mt. Tabor during one of the Hasmonean rebellions. 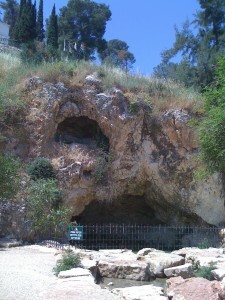 Later, in 66 A.D., the mountain served as a temporary sanctuary to Jews from the Galilee under the command of Josephus Flavius. Of course, Roman rule was also the time of Jesus’ preaching’s, and for Christians Mt. 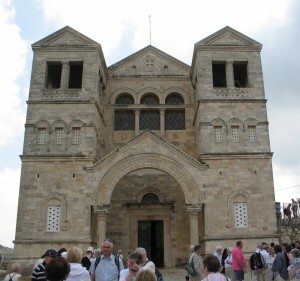 Tabor has special significance as the place of Jesus’ Transfiguration. Tradition holds that upon the mountain Jesus became radiant, and in the company of his disciples, spoke with Moses and Elijah (Luke 9:28-36), and was called “Son” by God ( Mathew 17:1-9). During the Byzantine period the mountain, became known as the Hill of Transfiguration, and Christians began to celebrate this miracle with the erection of a monastery and several churches on the summit. These structures were subsequently destroyed by the Mamelukes, rebuilt by the Crusaders, and destroyed again in subsequent battles. The current basilica, designed by the Franciscan architect, Antoine Barluzzi, was completed in 1924 and is set upon the ruins of earlier churches. As you spend time in the basilica, be sure to admire the, use of arches throughout, three naves which are separated by two rows of columns with their intricate floral carvings, as well as the gilded mosaic above the alter portraying Jesus’ Transfiguration. Jesus’ conversations with Moses and Elijah are commemorated in each of the chapels located in the bell towers. Let’s take a last look at this mosaic of colors stretched out before us as we descend from Mt. Tabor to our next destination. At the bottom of the hill turn right and follow route 65 to route 716, where you will turn left to Kibbutz Ein Harod (Ichud). As it may not be easy to find the art museum on the kibbutz grounds, don’t hesitate to ask for directions. The museum has come a very long way from its meager beginnings in 1937 housing artifacts in a wooden shack. 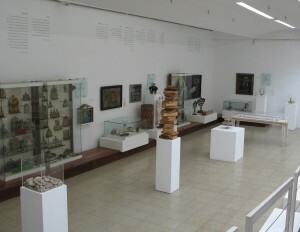 These early collections were gathered by Chaim Atar, a member of Kibbutz Ein Harod, who had settled in Israel in 1922. As a painter, Atar was influenced by the School of Paris, and his many portraits include family and his neighbors on the kibbutz. 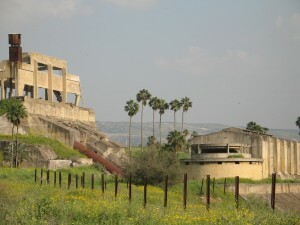 The current structure was completed in 1948 during Israel’s War of Independence, and as such, it was the first museum to be built in the nascent state. As you stroll through the expansive galleries and courtyards you will no doubt appreciate the architect’s use of natural light to highlight the exhibitions.Though buildings in the Bauhaus School are prevalent throughout Tel-Aviv, it’s quite unusual to find its representation in rural Israel, especially in the form of modernist museum architecture. Today, the museum’s collection exceeds 16,000 paintings, drawings, prints, artifacts, sculpture and Judaica, some of which dates to the 17th century. The museum features ongoing solo exhibitions, most recently featuring such well known Israeli artists as Gabriel Klasmer, Moshe Gershuni, Uri Lifshitz and Tzibi Geva. 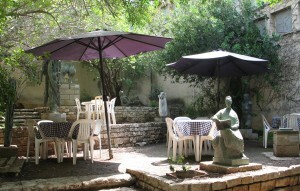 Internationally recognized sculptors have their works displayed in the museum, but especially in the tree lined courtyards. In fact the museum’s cafe offers an excellent al fresco lunch, permitting you to sit comfortably surrounded by stone and bronze masterpieces. Also, a new auditorium to accommodate large groups is nearing completion. Visiting hours to the museum are daily from 9 to 4:30, Fridays and holidays 9 to 1:30 and Saturday 10-4:30. You may also wish to call 04-653 -1670 before visiting the museum. It’s a short drive from Kibbutz Ein Harod to our next destination, Ma’ayan Harod (Harod Spring). Turn left out of the kibbutz and proceed to route 71, turn right, then left following the sign to Ma’ayan Harod. 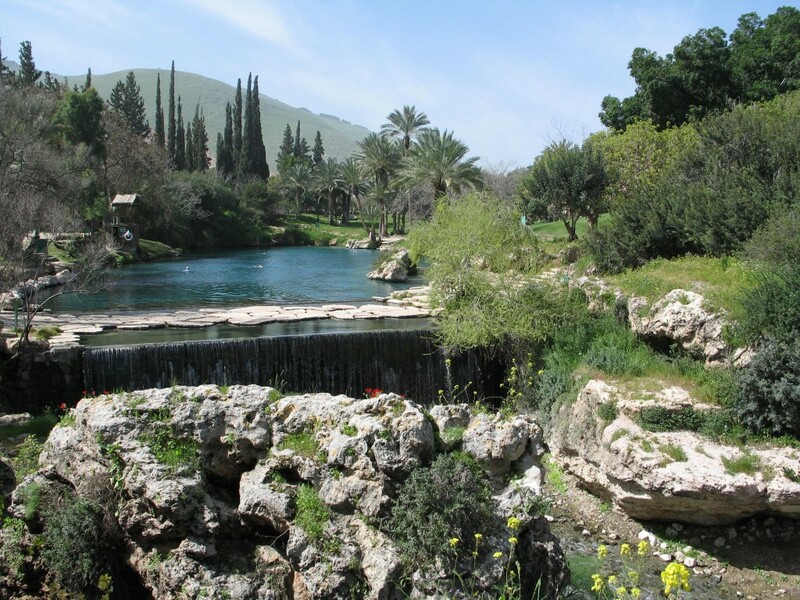 The national park is situated at the foot of the Gilboa mountains and offers visitors the opportunity to visit a spring with a significant biblical connection and the burial site of Yehousha and Olga Hankin. Group reservations to visit the Hankin museum can be made by calling 04-653 -2211. Park your car near the concession stand and make your way to the trail or steps leading up to the small white house on the ridge. This Bauhaus structure was built by Yehousha Hankin in 1936 as the place to which he and his wife Olga would one day retire. This unfortunately did not come to pass, but immediately adjacent thereto is their final resting place. 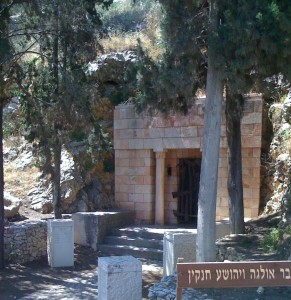 The ornate style of the mausoleum, use of columns and rose and pink colored marble, intentionally replicates the rabbinic tombs in nearby Beit She’arim. Adjacent is a KKL/JNF memorial plaque which enumerates the amount of land Hankin purchased during the first quarter of the 20th century on behalf of the World Zionist Organization, the Jewish National Fund, and other organizations, in what is today the Jezreel Valley, Rehovot, Hadera, Akko, and Emek Hefer. His knowledge of Turkish law, fluency in Arabic, and intimate knowledge of the customs of the local Arab population, permitted Hankin to successfully negotiate transactions valued at hundreds of thousands of dollars with absentee Arab landowners in Beirut and Damascus. Much of this purchase was malarial swamp, and it was only through the tireless efforts of Jewish pioneers, that this land was transformed into the rich farmland that we viewed earlier today from Mt. Tabor. As you descend the cliff make a point to stop at the sculpture memorializing the soldiers who have fallen during Israel’s many wars defending the land that Hankin had purchased. As the sculpture commemorates the heroism of the young fighters of modern day Israel, so does the area immediately below harken back to the battles of the biblical Israelites. At the foot of the cliff there is a small spring-fed stream and cave. It is here that you can take a moment to reflect upon the passages in Judges that speak of the unconventional test performed by Gideon in choosing his men for the battle against the Midianites. The biblical passage goes on to speak of the success of Gideon’s troops, who under the cover of darkness used only torches, trumpets and jars to over come a much larger fighting force. Interestingly, it is with this battle in mind, that a devout Christian serving in the British army in the 1930’s and 1940s, chose to train Jewish fighters at the spring in the use of unconventional fighting methods. Today, Orde Wingate, a decorated British army officer, and lover of the Jewish people, is revered among Israelis for his friendship and for the instrumental role that he played in the training of Israel’s first military commanders. 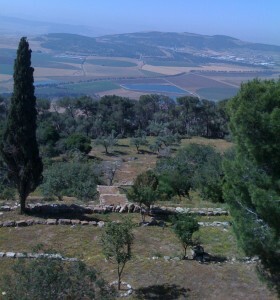 We will now make our way to the nearby Beit Alpha Synagogue via a scenic drive over the Gilboa mountains. Exit the national park to the left and continue on route 71 to route 675. There, on a hill, you will pass a new complex known as the “Gilboa Gateway” with its cafes, ski lift and synthetic grass and snow ski slope. Ascending from the foothills to the heights you’ll travel on route 6724 through a dense forest of evergreens. During your drive, you’ll find numerous picnic groves created by the KKL/JNF, some of which are named for King Saul’s family, scenic lookouts to the shimmering pools of the fish farms in the valley below and hiking trails along the ridge. 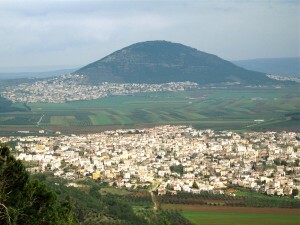 It is on Gilboa that Saul, the first king of Israel, and his son Jonathan, were killed in battle against the Philistines. David lamented the death of his friend Jonathan when he proclaimed ” Ye mountain of Gilboa, let there be no dew, nor rain upon you, neither fields of choice fruits…”(II Samuel I: 19-27). However, today if you are fortunate enough to visit Gilboa in late winter, you may have the opportunity to see fields of cyclamen, crocuses and daffodils carpeting its slopes. 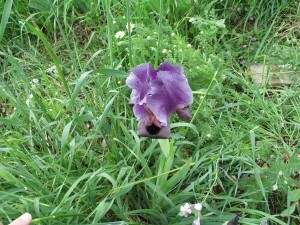 By March, the unique Gilboa Iris attracts thousands of Israelies to the mountain range, so watch out for traffic jams! We will now make our way to the Beit Alpha Synagogue to view one of the most beautiful and interesting mosaics ever found in Israel. Use route 6666 to descend from Mt. Gilboa and at route 669 turn left following the brown signs to the antiquities. Make your first stop at the Beit Alpha National Park the model of the synagogue in the court yard which depicts its use during the 6th century. Note that the synagogue had a second story which accommodated women sitting in the balcony, a feature that was not reconstructed by the archaeologists. The Beit Alpha Synagogue was excavated in 1929 by the Hebrew University under the direction of the well respected archaeologist E.L.Sukenik. The excavators established that a tiled roof covered the sanctuary which was divided by two aisles with columns, and an apse containing the Torah. 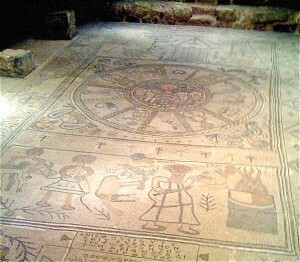 However, the most noteworthy finding was the colorful and naive mosaic which carpets the entire floor of the synagogue. The upper panel of the mosaic depicts traditional Jewish ritual objects including an intricately carved Aron Kodesh ( holy ark), a candelabra and two lions, while the lower panel, in a cartoon-like fashion, tells us the story of the near sacrifice of Isaac. Most beautifully depicted however, is the Zodiac centered in the middle of the floor. The twelve astrological signs are accompanied by their Hebrew names and in the center, constellations surround the sun god Helios who is seated in a chariot drawn by four horses. In the corners, busts of winged women symbolize the four seasons of the year. But there is something most unusual about this Zodiac as compared to those that most of us are familiar with. Here, the signs move counterclockwise and are not aligned to correspond with the representation of the four seasons! Many scholars believe that the Beit Alpha Zodiac was used solely for decorative purposes, as by the 6th century its use had become common in other synagogues throughout the land of Israel. Imported initially from Persia to Palestine, the use of the Zodiac was condemned by the prophets as a desecration of the Second Commandment “not to make a likeness of the heavens above”. However, over time the use of astrology became accepted in the land as the Jewish People adapted to their pagan and Christian environments. You can learn much more about the use of the Zodiac, the artists that designed the mosaic, the synagogue’s destruction during an earthquake, and the excavation, during the movie presented before your self guided walking tour. Visiting hours at the national park are daily 8-4 and Fridays and holidays 8-3. Summer hours extend one hour later. You may wish to call ahead at 04-653-2004 for further information. We will now proceed to our next destination a short distance away. From Beit Alpha return to Route 669 in the direction of Beit Shean, and then turn right toward the Gan Hashlosha National Park. Here, you and the kids can enjoy a warm swim in the spring fed Amal stream which has been enlarged into several large natural pools surrounded by lush foliage and slopping lawns. These pools are one of the main attractions of the national park known as Gan Hashlosha, the garden of the three. The Hebrew name memorializes three Jewish settlers who were killed in 1938 during the Arab Riots of 1936-1939. The park is also commonly known by its Arabic name el-Sakhne, and today is a favorite gathering spot for visitors to Israel, Jewish residents of nearby kibbutzim and moshavim and Arab families from nearby villages. You can easily spend several hours at the park soaking in the sunshine, exploring a cascading waterfall, jumping off the rocks into the constant 82 degree (F) water or barbequing a meal. A short walk will take you to a restored water powered mill as well as a Madafeh, a traditional Arab hospitality room. A stroll through the regional archaeological museum, which houses some artifacts from nearby Beit Shean, and an exhibit about the Etruscans, may also be of interest. The swimming areas are usually staffed by lifeguards and changing rooms are available for bathers. Visiting hours during the summer are 8-5 and Fridays and holidays 8-4. The park closes one hour earlier in winter. Near the entrance to the park you may have noticed a large wooden tower. 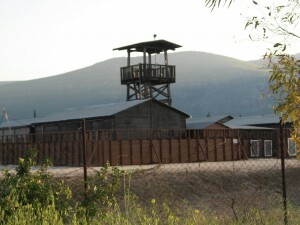 This structure is a replica of Tel Amal, built by residents of Beit Alpha, and is typical of the towers and stockades that were established by the Jewish Agency in Mandatory Palestine in 1936. Fiftyseven of these structures, constructed in large part by prefabricated segments, were erected during one night throughout the country as a defensive measure against marauding Arabs. Not unlike the American fort, the stockade provided protection to settlers and the tower a means of recognizance. During the three year Arab Riots (1936-1939) this line of towers and stockades served as an effective mechanism guarding newly established kibbutzim and moshavim, and as a way to establish a Jewish presence along the Mandatory borders. A short film inside the stockade provides detailed information about this period of time, while a walk through the living quarters sheds light on the cramped and primitive living conditions of these early settlers. Nearby, the Gan Garoo will delight children and adults alike. Established with the assistance of the Australian government, the 4 acre park brings a bit of Australia to Israel with its representative flora and fauna. You can easily walk the grounds of the park to mingle with kangaroos, wallabies and walaroos lazily lounging under shady Eucalyptus trees. You’ll have fun observing the koalas dangling from the trees and watching an assortment of flying foxes (bats), cockatoos and emus. Also, don’t miss the adjacent gift shop for educational materials and everything Australian. The excavations at nearby Bet Shean merit a visit of several hours and are beyond the scope of this blog. If you choose to stay overnight in the immediate area to visit Bet Shean and then continue with our itinerary, Kibbutz Nir David near Gan Hashlosha may be most convenient. We will now continue our “off the beaten path” adventure to Israel’s best preserved Crusader era castle, Belvoir. Return to Route 71 and proceed east toward Route 90 via Beit Shean. Travel north on this scenic Jordan valley road for approximately 30 minutes, and then follow the sign for the six mile drive up the mountain. The Order of the Hospitalers aptly named their castle Belvoir, beautiful view. In Hebrew it is known as Kochav Hayarden, the Star of the Jordan, preserving the name of the nearby Jewish village of Kochav which had been inhabited during the Byzantine and Roman eras. During your self guided tour of the castle you will notice several pieces of masonry with Jewish images, including an engraved menorah, that were taken from the abandoned village by the builders of Belvoir. In Arabic the site is known as Kaukab al-Hawa, star of the wind, best described by the medieval historian Abu Sharma, as a place “amidst the stars like an eagle’s nest and abode of the moon”. The castle is situated on a precipice 1,500 feet above the Jordan river on the Naphtali plateau, opposite the mountains of Gilead, and 20 kilometers south of the Sea of Galillee. Based on its strategic location, the Hospitalers purchased a small feudal estate from the French nobleman Velos and in the 12th century built a magnificent fortress on the mountain. The castle became part of a series of defensive positions along the rift valley stretching from Nimrod and Safed in the north, in an effort to secure the eastern flank of the Crusader Kingdom of Jerusalem from Muslim attack. The fortress was designed as an early example of the concentric castle plan with a 10 meter deep moat surrounding a rectangular wall with towers at each end, and a well-fortified, two storey citadel, within. The moat was incorporated into the castle’s defensive design to protect the it from siege instruments, such as the battering ram and the assault tower. However, ultimately the successful breach came from the south east, along the slope of the mountain, to which area the moat did not extend. Nevertheless, the Crusaders at Belvoir withstood the army of Saladin for 18 months longer than their brethren who perished on mass in 1187 at the decisive battle at the nearby Horns of Hittin. And in the end, Saladin’s forces could not breach Belvoir’s impenetrable citadel, permitting an honorable surrender negotiated with the Christian fighters who were resettled in Tyre. To the Muslim rulers in Damascus, Belvoir’s continued presence appeared so fearsome that the remaining walls of the fortress were dismantled to preclude any thoughts of a reconquest by subsequent Crusader armies. Israeli archaeologists excavated the site in the 1960s, and its reconstruction permitted the opening of a national park some years thereafter. Today, the national park authority provides an excellent brochure eloquently describing points of interest inside the fortress. As you enter the main gate, be sure to look for the doorposts and square grooves which held large wooden doors in place. 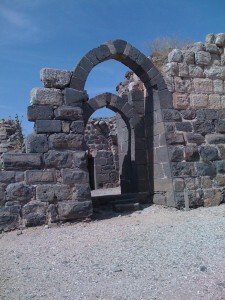 Then as you walk through the network of corridors note the defensive use of harder basalt stone in some areas, the strategically placed loopholes (archery slits) in the arched windows, and the main entrance to the citadel with its 90 degree hairpin turns precluding easy access to invading forces. As you walk from the inner fortress toward the bridge, look for the hidden staircase to the moat which would have provided the defenders with an easy avenue escape during the siege. The castle is a fun place to explore and it’s observation points offer vistas not often found in Israel. We will now return to route 90 and drive several kilometers north to visit “Old Gesher” near the confluence of the Yarmuk and Jordan rivers. Old Gesher (bridge in Hebrew) is the name given to a museum, a number of stone buildings and a model hydraulic power plant that now occupy the site of a kibbutz that thrived there until Israel’s War of Independence. In the early years of the 20th century, Baron Edmund de Rothschild purchased land in Ottoman controlled Palestine in an effort to resettle Jewish European victims of pogroms while establishing commercial opportunities for himself. ( see blogs for Zichron Yaakov and Rishon Le Zion). In 1939, at the behest of the Jewish Agency, members of the Jewish Palestinian youth movement HaNo’ar HaOved, together with newly arrived refugees from Europe, established a Tower and Stockade settlement on land purchased years earlier through the Baron’s generosity. During the next decade the settlement evolved into Kibbutz Gesher, many of whose 120 residents farmed the fertile fields of the Jordan valley. 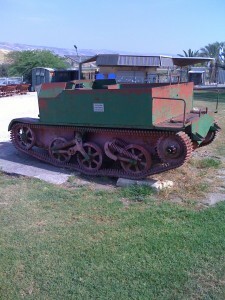 Its strategic location made the kibbutz a target for attack, and indeed in April and May of 1948 it endured an onslaught of Iraqi and Arab Legion forces. While 50 of the children were evacuated to Haifa under the cover of darkness, the rest of of the members of the Kibbutz and soldiers from the Golani Brigade, held their ground at the sttlement and the adjacent British police station. This ‘Tegart” fortress-style station, similar to those on route 35 in the Negev and at the route 1 Latrun Junction, can only be viewed from the outside. However, this bullet and mortar pocked building today stands as a silent reminder of the ferocity of the attack and the bravery of the defenders of the kibbutz. Gesher was almost completely destroyed during the war of independence, and only after a peace agreement with Jordan was signed in 1994 did reconstruction of some of the original buildings commence. Park your car near the kiosk and walk to the border fence to view the remains of the ancient Kahn (inn), the railroad tracks and the three bridges in front of you. 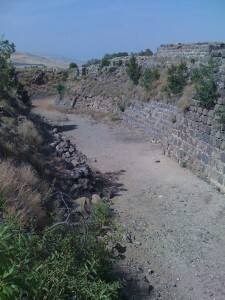 The oldest bridge, known as Jeser el-Majama, or meeting bridge, dates back 2,000 years to the Roman era, and connected the east and west banks of the Jordan river as an extension of the Via Maris. The railway bridge was built in 1904 by the German engineer Meisner, who developed the “Valley of the Train” connecting the cities of Haifa and Damascus permitting Muslim worshipers in the region to make their Hajj to Mecca. The third bridge was completed by the British in 1925 as part of the road linking Beit Shean and Tiberias along with its northwest extension to Jordan and Iraq. All three bridges were intentionally bombed by Israeli forces in 1948 to preclude their use by invading Arab legion and Iraqi forces. An audio visual presentation recreating the history of “Old Gesher” can be viewed at the former fighters’ bunker which now serves as a visitors center. There, you can also visit the former medical clinic, kitchen and communications room used by the defenders of the kibbutz. Perhaps most interesting is the model of the Naharayim power plant that was developed by the kibbutz in cooperation with the Israel Electric Company. Children will especially enjoy walking through the system of dams and bridges complete with a tower and turbine room, all the while hearing the sound of running water accompanied with flashes of light and color. Remains of the actual power plant can be viewed in the distance as you stand in the courtyard of the former kibbutz. A better view of the former hydraulic power plant can be had several kilometers north on route 90 at Naharayim. There, a tour guide from the adjacent Kibbutz Ashdot Yaakov can provide two excellent tours of the realized vision of the father of Israeli electricity, Pinchas Rutenberg. On the first tour, the guide will lead you on a partial driving and walking tour along the Yarmouk river from the bridge above the 1,300 meter long concrete canal known as the “Zero canal” through an observation of the “access dam” and the remains of the destroyed “train dam”. You’ll have the opportunity to view the area which served as the former water reservoir, lake Nahahrayim, and the nearby Bauhuas style turbine engine rooms. The second tour, which is done almost exclusively by car, permits you and your guide to actually enter the Kingdom of Jordan to visit the Island of Peace. The 1994 peace agreement between Israel and Jordan created a special regime for a portion of land that had been previously used by Rutenberg’s hydraulic power plant complex.The island was returned to Jordanian sovereignty , but leased back to Israel for agricultural and tourism purposes. Access to the island requires a brief border inspection but does provide closer access to view the various hydraulic installations. The island is also the site of the 1997 murder of seven Israeli school girls by a Jordanian soldier, an event that prompted King Hussein to personally visit each of the girls’ grieving families in Israel to express the sorrow of his Jordanian subjects. Their memory is today beautifully commemorated on ” the picked flowers hill” behind the tourist kiosk. A climb up to the adjacent observation tower provides a striking view of the memorial and the vast system of bridges, canals and abandoned buildings below. Reservations to tour the Island Of Peace can be made by calling Kibbutz Ashdot Yaakov 04-670-9143. Visiting hours at Old Gesher are Saturday-Thursday 10:00-4:00, Friday 9:00 to 1:00. Further information van be had by calling 04-675-2685. You can now continue your tour of the Jordan Valley by returning to Route 90 and proceeding north to Tiberias and the religious sites at the Sea of Galilee. Look for future blogs discussing these in detail.